Avalon Organics Strengthening Peppermint Shampoo is a gentle, natural and organic shampoo that is free of harsh preservatives and hair-stripping cleansers. It contains peppermint oil, babassu oil, aloe and vitamins that work together to strengthen hair, repair split ends and tame fly-aways. It comes packaged in a dark green bottle that holds 325ml of product with a black flip cap lid and that is made up of 100% recycled materials. 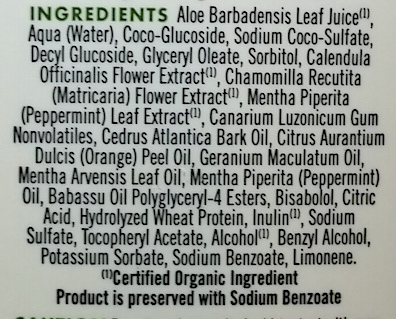 The product information is included on labels on both the front and back. The product itself is a clear, gel-like consistency that smells of peppermint. 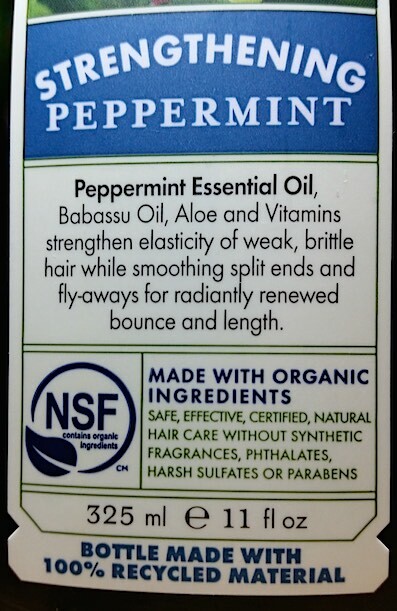 To use, you need to apply a small amount of the Strengthening Peppermint Shampoo to wet hair and massage in. Once massaged into a good lather, you need to rinse it thoroughly with water. Follow up with a conditioner, if you wish. I find that this shampoo lathers up really well. Because of that, you honestly don’t need to use much of it at once. I’m sure that you’re all familiar with the phrase “squeaky clean,” and Avalon Organics Strengthening Peppermint Shampoo is one product that you can actually describe as being that way. It is probably difficult to understand unless you try it, but I find that during the rinsing stage when using this shampoo, your hair actually feels “squeaky clean”. Skipping back to the start for a second though, the first thing that you notice about this shampoo is the beautiful, fresh, peppermint scent. It’s a fantastic way to help kickstart your day as it feels and smells super refreshing. There are some natural shampoos (I’m looking at you, Weleda Millet Nourishing Shampoo!) that don’t lather up too well. Whilst this isn’t an issue to be particularly bothered by, one difference with Avalon Organics Strengthening Peppermint Shampoo is that it is on the total opposite end of the scale. It lathers up amazingly well. As well as meaning that you don’t need to use as much during application, it also means that the hair washing process is faster than when using a shampoo that doesn’t lather as easily. After washing though I do recommend a conditioner. That “squeaky clean” effect that I was just discussing a moment ago can create slightly knotty hair if not followed up by one. Conveniently, there is a Strengthening Peppermint Conditioner (£5.99/$10.50) available to work in conjunction with the shampoo! In regards to the strengthening properties, I have found that this shampoo does help. I have found hair breaks less often and fly-aways are tamed. I can’t pass judgement on split ends though as I don’t currently have any. Overall though I do like the Avalon Organics Strengthening Peppermint Shampoo. My only real issue with it is the fact that I find it to be slightly drying to the hair. Using a good conditioner can counter this, but if you don’t use anything after shampooing then you may be irked by this too. Otherwise, if you’re looking for a natural shampoo to help strengthen your hair then this one is well worth a try. You can purchase a full-size, 325ml bottle of Avalon Organics Strengthening Shampoo for £5.99 from Holland and Barrett or the Avalon Organics website (which only has it listed in USD and not GBP) for $10.50. What are your thoughts on Avalon Organics Strengthening Peppermint Shampoo? What are your favourite natural haircare products?